Bit Stew Systems, the developer of the game-changing smart grid analytics platform, Grid Director, announced today that it has released version 3.3 of its popular smart grid management platform. The major emphasis of version 3.3 is the introduction of a number of advanced grid management features tailored specifically for smart grid network operations centers. Bit Stew Systems, the developer of the game-changing smart grid analytics platform, Grid Director, announced today that it has released version 3.3 of its popular smart grid management platform. 1. 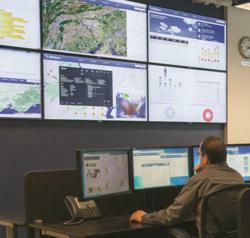 Visualization panels specifically designed and tailored for use in network operation centers. 2. Enhanced analytics and features for grouping, sorting and filtering data from network routers and communications links. 3. Seamless transition between panels, dashboards, tables, reports and the interactive map. 4. Enhanced troubleshooting tools to rapidly identify problem devices, routers and meters. 5. Additional sophisticated trending and data forensics tools and capabilities. “We are very pleased to see that most of our customers have expressed a strong desire and commitment to leverage the power of Grid Director to orchestrate and visually represent the diverse technologies deployed throughout the smart grid ecosystem,” says Kevin Collins, CEO of Bit Stew Systems. “Version 3.3 is an exciting extension of our existing platform and builds more capabilities into our mapping and analytics engine. We have designed the functionality in consultation with leading utilities and trialed in test and pilot systems. The feedback from our customers has been extremely positive,” according to Alex Clark, CTO of Bit Stew Systems. Bit Stew Systems’ game-changing software platform, Grid DirectorTM, helps utility companies deploy, manage and optimize smart grids. Our solutions enable utility companies to understand in real-time what is happening with their smart grids, and to make better, faster decisions as a result. Founded in 2005, Bit Stew began with the vision of building a robust, scalable software platform that provides real-time analytics, dynamic event management, situational awareness and a fast and easy way to integrate into both IT and operational systems and applications. The company is headquartered in Vancouver, British Columbia with offices in Mountain View, California and Toronto, Ontario. Grid Director is a registered trademark of Bit Stew Systems Inc.